For the first time in history Canadian siblings share the podium at an Olympic event! 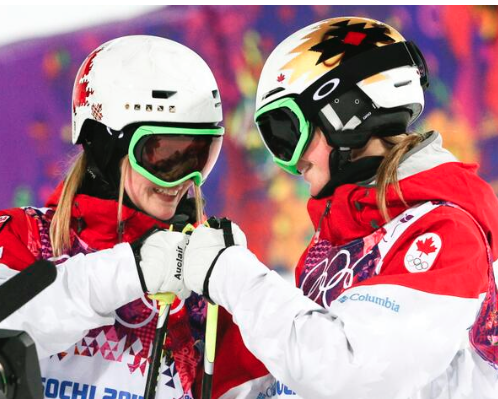 There was not a dry eye in my house (except mine, because I don't have tear ducts) when Justine and Chloe Dufour-Lapointe won gold and silver medals in women's freestyle moguls this morning at the Sochi 2014 Olympics. Beating out the 2010 gold medal winner from the USA. Could you imagine? Winning a medal at the Olympics and having your training partner and sister standing next to you to share the moment with! Amazing. This is the kind of things the Olympics are made for. Well that and commercials that make people cry. This is the first GOLD for Canada...first of many!